Description: River otters have long, sleek, streamlined bodies with thick, shiny fur and a long, thick tail. They have short legs, webbed paws, and a pointed face. Small eyes high on their head permit them to see above water while swimming, and a clear third eyelid protects their vision underwater. Otters have a broad nose with nostrils that can close to prevent water from entering and small ears that can do the same. River otters have dark brown coats with lighter throats and chests and they have long, sensitive whiskers. Oils, secreted from glands near the base of the tail and meticulously groomed through the hair, keep the river otter’s coat shiny, waterproof and insulated against the cold. Total body length is about 1.5m (4.5-5feet) long with the tail accounting for nearly one-half of that length. Weighing up to 15kg (33 pounds), river otters are very playful, often seen sliding on mudbanks or snowbanks while vocalizing an assortment of sounds ranging from chirps to low grunts and growls. Distribution and Habitat: River otters live anywhere there is a permanent water source and abundant food. They are found in rivers, streams, ponds, lakes, marshes and any other wetland area, even along marine coasts. Once found throughout North America, extensive trapping and habitat loss has severely decreased the river otter population in the central United States. 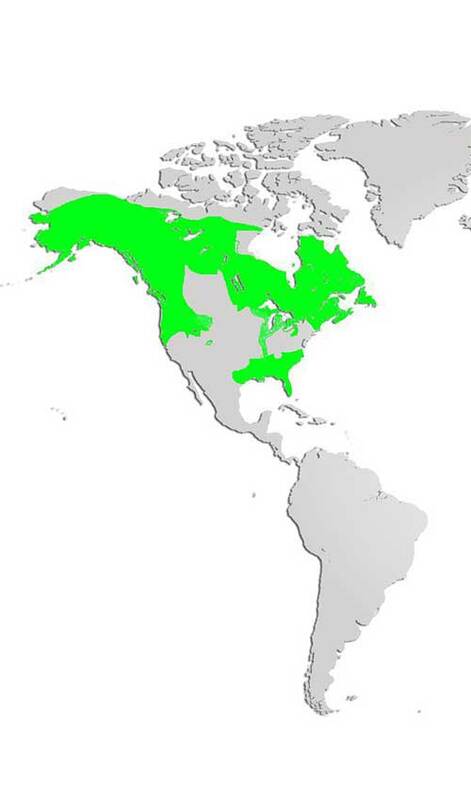 They are still abundant throughout the western and eastern United States and occur throughout Canada as far north as parts of the territories and Alaska. River otters are found in the wild throughout Nova Scotia. Diet: Carnivores, eating mostly fish such as minnows, perch and trout, river otters will also eat other aquatic items like clams/mussels and crustaceans, as well as frogs, muskrats, birds (particularly young waterfowl), eggs, insects and even turtles. Life Cycle: River otters mate in early spring but due to delayed implantation do not birth their young until almost a year later. The fertilized eggs do not attach to the uterus or begin to grow until late winter. A litter of 1-6 young (kits) is born in spring, which is followed by adult mating season. The young are born blind and helpless, though they have fur. Their eyes open at 35 days and at around 2 months old they begin to swim. Young otters spend the summer with their mother, learning to hunt before they are ready to be independent in the autumn. River otters have dens on land in which to sleep and have their babies. They have few natural predators, especially while in the water, but coyotes and wolves will hunt otters on land. River otter lifespan is 5-8 years in the wild. 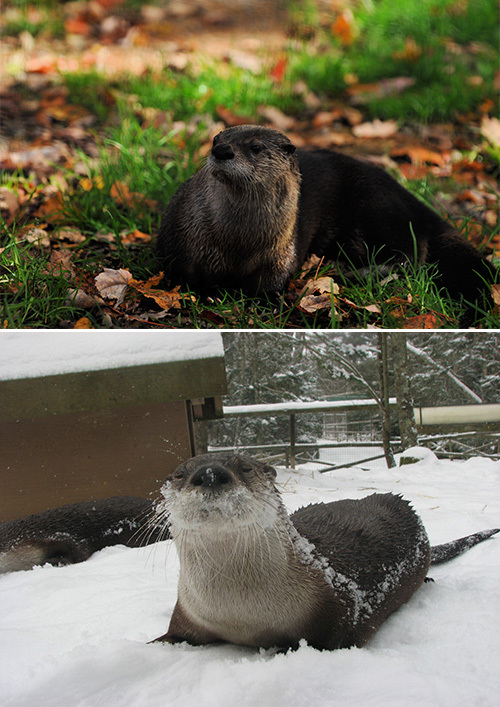 Adaptations: River otters are well suited for their semi-aquatic lifestyle. They are streamlined with waterproof fur and webbed feet to help move quickly and easily through the water. Valves in their ears and nose keep the water out and clear third eyelids protects their eyes and allow them to see underwater. Specialized lenses in their eyes also increase the otter’s vision in murky water, plus sensitive facial whiskers aid in maneuvering underwater. River otters keep holes open in the ice so they can remain active through the winter without getting trapped under the ice. Their oil-insulated fur keeps their skin warm and dry in cold water. River otters are very sensitive to pollution as polluted makes their fur less waterproof, and can severely limit food sources. Did you know? River otters can hold their breath for around 8 minutes, allowing them to swim more than 400m (0.25 miles) without surfacing! They can also dive up to 18m (60ft).